Halon Fire Fight1 Auto Deploy Fire Extinguishers with a Straight head. The Halon unit can stand up or lay down depending on mounting space available. The great thing about this Halon Auto Deploy Fire Extinguisher, you do not have to be present at the time a fire starts, non do you have to trigger any release. This unit will automatically deploy, extinguishing the fire leaving everyone at safe distance from the start fire. The release is set for about 165 degrees. Most RV owners are installing this type of fire stopping protection behind the Norcold 1200 series refrigerators, due to the very high fire risk of the OEM cooling units till they have the Amish built cooling unit installed. This unit is also need behind any and all models of both Dometic and Norcold. We do still have a few customer that will install this safety extinguisher behind their newly replaced Amish cooling unit just to have that extra peace of mind. This unit can also be mounted in the engine compartments, Gen Set compartments, and any other locations of concern. Halon Fire Extinguishers are offered through RV Cooling Unit Warehouse's 2 web sites, hopefully saving customers life. RV's, classic and custom automobiles, golf carts, UTV's and more. "Automatic" means our systems have a heat sensitive "thermal" triggering device similar to that in a commercial office building "automatic" fire suppression system. When the heat in the area reaches the threshold of the sensor, the fire suppression system is released and you are protected from whatever heat source has caused the problem. No switches, no deployment procedure, if you have heat in the compartment, you have fire protection-- it's just that simple! like the standard powder type most owners already have in their coaches. Do yourself a favor, check yours now.... chances are it's a damaging powder based extinguisher. Fire Fight offers a clean agent gas alternative!! Clean Agent Gas is simply put one of the best fire extinguishants known to man. The term "Clean Agent Gas" refers to Halon 1211 and 1301, HFC227 and FE36 among other gas formulations that are designed to deprive oxygen from a fire situation effectively taking away the ability of a fire to ignite & burn. This concept of fire suppression has been extremely effective for decades and is still the best way to stop fire in a closed environment and eliminating damage from the fire as well as from fighting the fire. 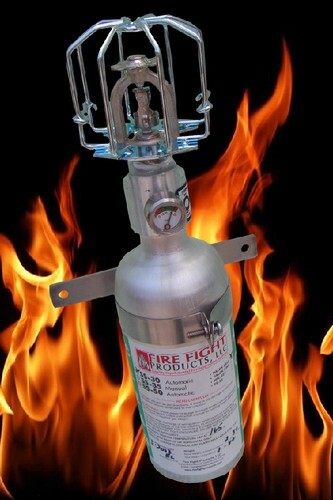 Clean Agent Gas has three times the fire fighting effectiveness of CO2 extinguishers. Clean Agent Gas does not damage the fire area as "Dry Powder" extinguishers do. The saying goes, "whatever is hit with a dry powder extinguisher, whether it is burned or not will usually need to be replaced due to damage from the caustic, corrosive dry powder itself." We understand that in the case of fire, the first consideration is and should always be to protect life and to try to put out the fire but you also must consider life after the fire. Clean Agent Gas is discharged as a liquid immediately converts to a gas with fast breakup into the atmosphere. This makes it easy to direct and it reaches into hard to penetrate places where a fire or it's ignition source may be. The new "Green Gas" HFC227, is safe to the invironment not containing CFC's as the original Halon did. No longer commercially available, HFC227 is a very good alternative clean agent gas formulation for the future. Clean Agent Gas is non-conductive of electricity and is effective on all three classes of fires (A,B & C). Our product line incorporates many Clean Agent Gas designs both automatic passive and hand held deploy. We are also able to custom design a system for special applications if needed. Please feel free to ask questions.